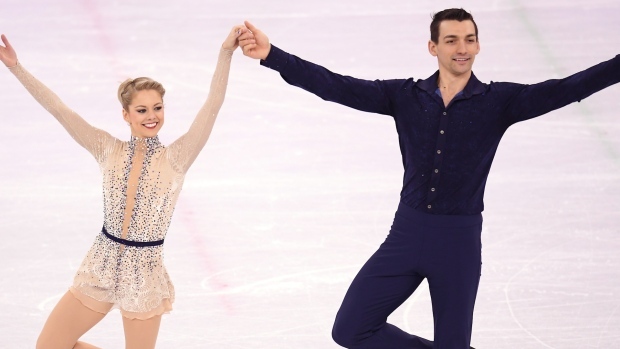 Team USA’s lone entry in pairs’ figure skating, Alexa Scimeca Knierim and Chris Knierim, finished the short program portion of the competition in 14th place Wednesday morning at Gangneung Ice Arena. The score qualified them for the next stage, free skate, set for Thursday morning. Skating to “Come What May” from “Moulin Rouge!” the Knierims scored a 65.55 — 34.18 for their technical score and 31.37 for performance. They were the 13th of 22 pairs to skate, with the top 16 advancing to the final. It has been a busy first week in Pyeongchang for the husband and wife team. As the only U.S. pair, the Knierims skated both the short program and free skate in the figure skating team event, in which Team USA took bronze. In total, the schedule has forced them to skate in competition three times over a six-day span. They will make it four times in seven days Thursday in free skate. A big moment in the pairs’ event came when the 10th team took the ice: Tae Ok Ryom and Ju Sik Kim of North Korea. The pair received a warm ovation from the South Korean crowd and scored a 69.40, good for advancement in 11th place. Alexa Scimeca Knierim and Chris Knierim began their quest for pairs gold on Feb. 14, skating to the song "Come What May" from the film "Moulin Rouge!" Reigning world champions Sui Wenjing and Han Cong of China finished the short program in first place, while Evgenia Tarasova and Vladimir Morozov of Olympic Athletes from Russia were in second, with Canada’s Meagan Duhamel and Eric Radford in third. Medals in pairs’ figure skating will be awarded after the free skate.